This prewriting activity walks students through making an outline of a narrative essay, from the central ideas to the important details. Students will review interjections and kinds of sentences — then brush up on their acting skills with an interactive classroom game! 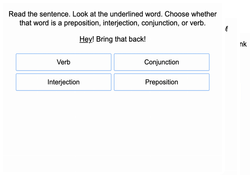 Teach your fifth graders when interjections are appropriate and how to use them with these exercises that have a variety of questions and helpful hints.